3 Easy Appetizers! 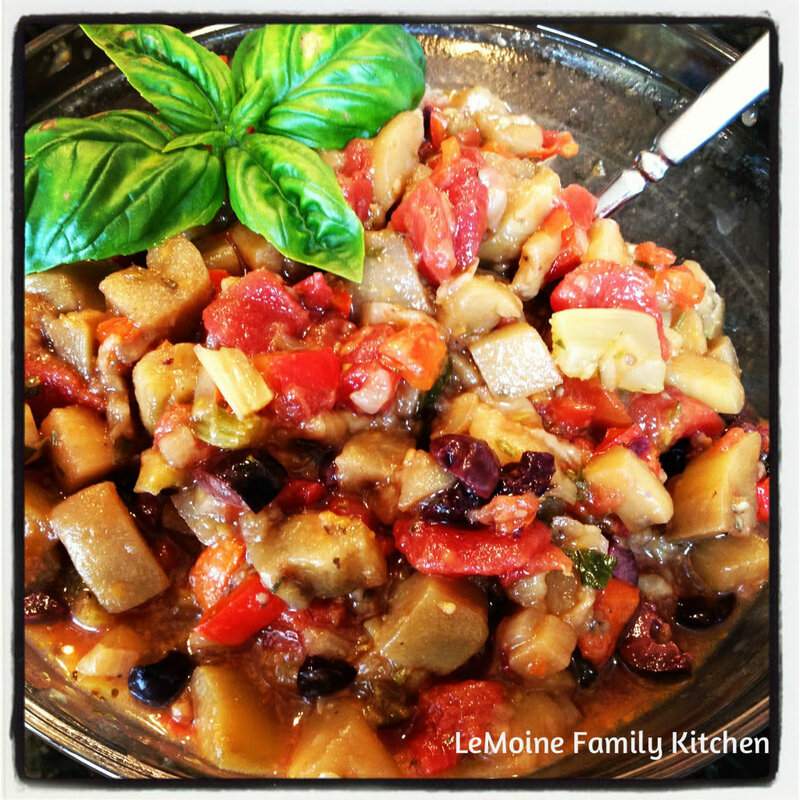 Eggplant Caponata, White Bean Dip and Spinach Artichoke Pasta Salad. Perfect party food that everyone will love! These holidays are a funny thing… Mothers Day we are treated to a quite brunch out and then the following month Fathers Day is all about the at home BBQ and some beers, all handled by yours truly. So yes I have volunteered to host this year. I tend to go overboard when it comes to entertaining and will spend the entire time in the kitchen. This time I am going to keep it simple! First i’ll have a few “picky” things: Caponata with crostini, White Bean Dip with pita chips and Mini Tomato and Mozzarella Skewers. Then the BBQ part… Burgers, Hot Dogs, Teriyaki Chicken Skewers and a Cheese and Parsley Sausage Ring with peppers and onions. One the side a very simple Spinach, Artichoke & Sun Dried Tomato Pasta Salad and an Arugula & Watermelon Salad! The great part is that I can do most of this the day before so I can actually spend the day enjoying being with my family, especially my husband and my dad. That is the important part right, having great food to share with your family but not being stuck in the kitchen all day?!?!?! So here are a couple of the recipes… more pictures to follow after Fathers Day. This is Giadas basic recipe with a few of my own tweaks. Its fantastic on its own served with crostini or can be tossed with pasta as a cold pasta salad! YUM! Heat 1/4 cup of the oil in a heavy large skillet over medium heat. Add the celery and saute until crisp-tender, about 2 minutes. Add the eggplant and saute until beginning to soften, about 2 minutes. Season with salt. Add the red pepper and cook until crisp-tender, about 5 minutes. Add the onion and saute until translucent, about 3 minutes. Add the diced tomatoes with their juices, olives and oregano. Season with salt and pepper, to taste. Simmer over medium-low heat until the flavors blend and the mixture thickens, stirring often, about 20 minutes. Add the vinegar and sugar. Season with salt and pepper, to taste. Cover with plastic wrap, pop it in the fridge and let it get cold. Serve cold alongside crostini. This is much more about a simple idea and method then it is about the recipe. It is very much about your personal preference. If you want more lemon or more garlic flavor go for it! If you have bail instead of parsley, go with it! Want to kick it up a level… add roasted red peppers or sun dried tomatoes and you’ve got a whole new dip! In a food processor, add garlic and pulse to a rough chop. Add in the beans, parsley, lemon juice, salt and pepper. With the machine on drizzle in olive oil. Once everything looks relatively combined, stop and taste for seasoning and consistency. You want the consistency to be smooth and creamy like a hummus. Remember you can always add more oil if needed but definitely can’t take out if you add too much. Cool in fridge and serve with pita chips… which you can easily purchase or if you’d like to make your own, they are super simple! Cut pita bread into triangles, like you’d cut a pizza. Toss in a bowl with olive oil, salt, pepper and garlic powder (they should not be weighed down in oil, just enough for seasoning to stick). Bake on a cookie sheet for approx 12-15 minutes at 350. Check half way through because all ovens cook differently. Again this one is not about getting it exact but about the flavors you love. In a bowl combine pasta, sun dried tomatoes, baby spinach and artichoke hearts. Toss. In a separate bowl combine approx 1/4 cup of the oil from the sun dried tomatoes and a 1/4 cup of the artichoke marinade, whisk until well combined, this is your dressing. Add half the dressing, toss and decide how much more you need to add (pasta will soak up more of the dressing if it is still warm). You want enough to coat the pasta salad and for it to not be dry. Again, if the pasta is warm it will soak up more of the dressing so keep some of the dressing and add more before serving if needed. If you prefer a little more acidity squeeze the juice from half a lemon. Salt and pepper to taste. HAPPY EATS!!! Let me know if you give any of these a try and send me your thoughts!